Alia Bhatt who is known for her films like Badrinath Ki Dulhania, Dear Zindagi, Udta Punjab, Raazi, etc is once again in the news because of her bold avatar. She recently shot for Vogue magazine and looks mesmerizing in it. Donning a deep neck golden short dress, Alia Bhatt looked stunning in the pic. In another pic, Alia donned a baroque crop top and skirt with a jacket teamed well. 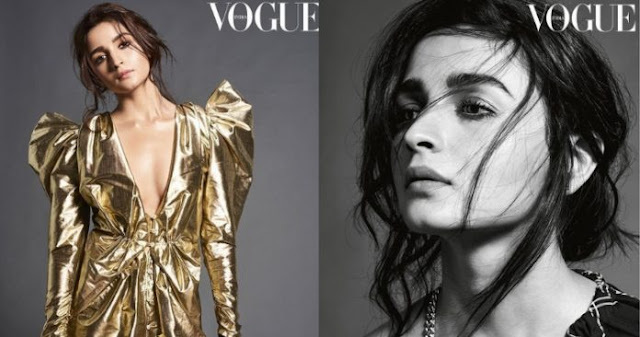 The actress shot for Vogue’s November issue and her pictures are too hot to handle. In the pics, the actress looks so stunning that it is difficult to take your eyes off her. We must say she perfectly knows how to turn heads with her fashion sense. On the work front, Alia will soon be seen in Gully Boy opposite Ranveer Singh. Apart from this, she will also appear in Brahmastra, Kalank and Takht.